Whether you need to get in shape, or you just want to tone your body, the best piece of exercise equipment for your home is a rowing machine. 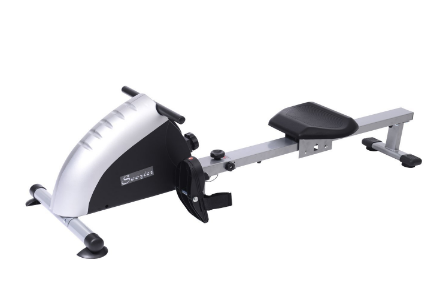 Also called rowers, these models feature handles that you grasp with both hands to work your lower body and a base that you move with your legs to work your lower body at the same time. Many are smaller in size and won’t take up a lot of space in your home. 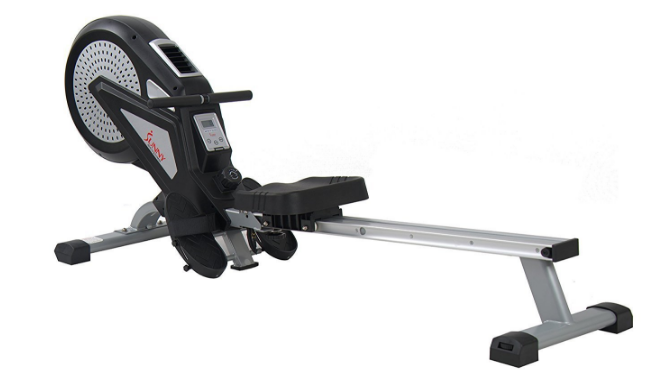 Instead of just naming one rowing machine the best around, we created a list of the top models from certain manufacturers as well as the best in different categories. You can also get help learning how to choose the top model and what to look for in one of these models when shopping online. The models that made our list perfect for amateur and professional athletes who want to stay in shape during the off-season and those who want to burn more calories at home. In A Rush? Here are some of our favorites! The footprint of a rowing machine refers to its overall size and tells you exactly how much space you need to use one. Manufacturers will list the length, height and width of the model in the item description. Though most are around the same size and shape as a small couch, you’ll find models that are larger and smaller and will fit in your space. 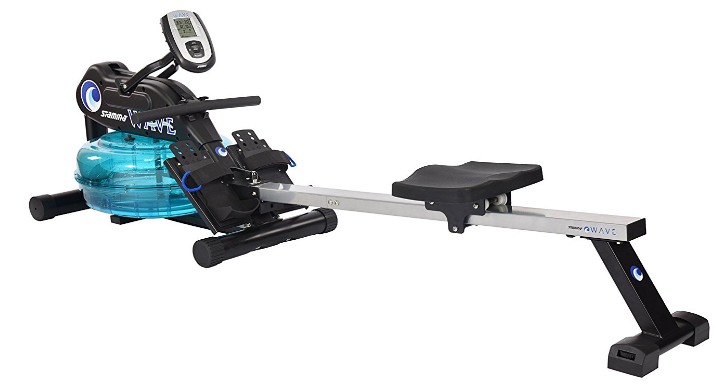 Rowers priced in the $400 range are lower end models that generally come with less features and may not last as long, but those in the $500 to $700 range are generally much stronger. Higher end models can cost a lot, but these models will give you access to all the same features that you would find on models in your gym. Air resistance models use your own pressure and intensity to determine the amount of resistance, but magnetic resistance models are more durable and run more quietly. You’ll also find hydraulic piston models that run pretty quietly and models that use water resistance. Water resistance models will recreate the sound of rowing on the water, and many come with refillable reservoirs or tanks that let you pour in the water of your choice and remove that water if needed. In addition to looking at the length to ensure that the model will fit in your home, you should also look at the length to make sure that the model an accommodate your body. Users who are taller or shorter than average may have a hard time finding one that they can use with ease. You want to reach the base of the model without feeling a stretch or pull in the back of your legs, but keep in mind that some have a longer pole or center bar that can support users of all heights. Back support is especially important because without proper support for your back, you’ll feel uncomfortable every time you step off the equipment. A lack of back support can also lead to pain in your lower or upper back and leave you dealing with injuries too. The seat that comes with it should cradle your back and keep it aligned with your lower body. The problem with cheaper models is that many use plywood, MDF or another type of inexpensive wood in the frame, which will not last very long. Manufacturers responsible for the more expensive models on the market use harder types of wood in the frame to ensure that it lasts for years. In the same way that a treadmill comes with a monitor on the front that helps you keep track of your workouts. 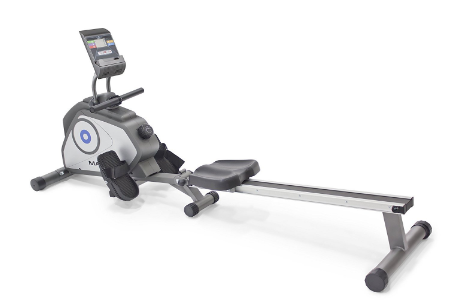 Most models feature a monitor that keeps track of the distance you rowed and the amount of time that you worked out. Newer models often come with built-in games and apps that can make sport more fun and keep track of features like your speed and heart rate. Before you decide on a full-size model that will take up a lot of space, look at some of the models that you can more easily store. Some will actually fold flat or into a more compact package that you can carry to another room, push into your closet or roll under your bed. When you’re on the hunt for a water resistance model and money is no object, the M1 HiRise with S4 Monitor is the ultimate equipment for your home. This model weighs 200 pounds and has a design that lets you flip it over and store it on its side to take up less space when not in use. It also features a taller seat that increases the resistance as you move back and forth across the top. Keeping track of your workouts is easy because the M1 HiRise comes with a Series 4 monitor that records your performance to show you details like how far you rowed, how long you worked out and even the length of the strokes that you made. It also has an enclosed water tank that holds the flywheel, which allows the wheel to make surf and other water noises as you row. 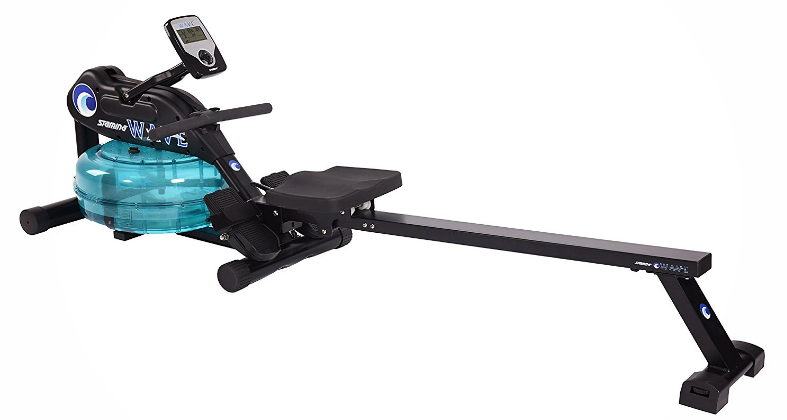 Whether you’re a athete and need to train during the off-season, or you just want to get in shape in the comfort of your own home, the Concept2 Model E Indoor with PM5 is a good choice because it comes with adjustable features like an arm that supports the monitor and footrests. At nine-foot long by four-foot wide, it has a large footprint, but when you need to store it, you can break it down into two smaller parts. Concept2 even added casters to the base of the model to let you more easily move it across the room. Its built-in Performance Monitor 5 keeps track of each stroke you make and records that data to help you view details about your workout later. It also features a 20-inch seat that can accommodate multiple users and a flywheel that cuts down on noises while moving just as smoothly as you need. 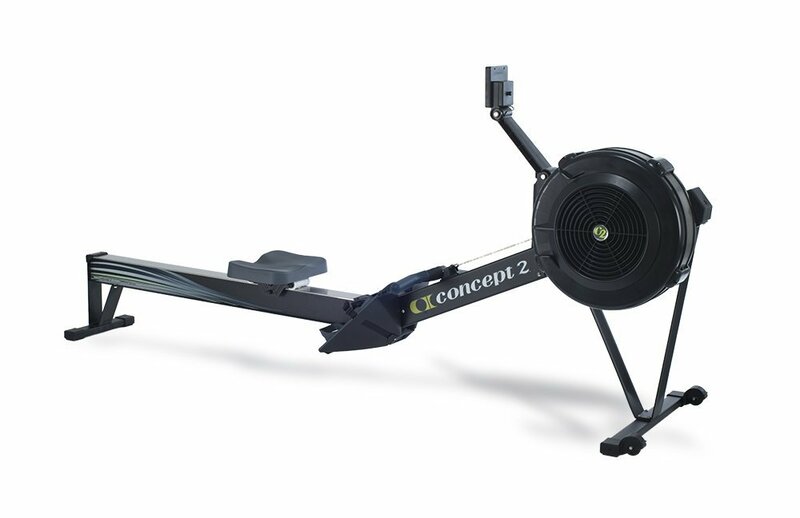 This Concept2 Model D Indoor with PM5 comes with the same Performance Monitor 5 as the last Concep2 model to help you keep track of your data, but this model is a little less expensive. Its 14-inch seat is best for users who are already in good shape, and this seat has a contoured design that increases your overall comfort. The included flywheel moves so smoothly that you’ll never hear a thing, no matter how long or how hard you workout. It’s included monitor sits right on the front of the model and has an adjustable arm that lets you change the location of the monitor to keep an eye on your workout. When you need to move or store the model, you’ll appreciate the caster wheels on the bottom and that the entire equipment breaks into two different pieces. If you want to keep track and monitor yourself as you workout, you’ll love this Stamina Elite Wave Water 1450 because it comes with a heart rate monitor that you can attach to your chest with the included strap to watch your heart rate and other features on the monitor, which adjusts to reach the height and angle you need. Weighing less than 90 pounds, this equipment is light enough that you can move it on your own when you need extra space, but it’s durable enough for daily workouts. The handle on it has a textured surface to help you get a better grip, and the molded seat is large and can fit different users. The footrests on the equipmemt have plates that adjusts to fit different size feet and straps that keep your feet from slipping off. You’ll also like the enclosed water tank that recreates real water noises as the flywheel moves. Stamina includes a siphon that you can use for removing water from the tank or filling it with extra water. With built-in wheels that move across any type of flooring and a folding design, this Conquer Indoor Magnetic Air is perfect for anyone who wants to workout at home but needs to clear some floor space after a workout. It comes with a smoothly gliding seat with an upholstered cover that adds to your comfort and foot pedals that you can adjust based on the size of your feet. You also get a great warranty that covers all parts for one full year and the frame itself for three years. The top feature of this Conquer Indoor Magnetic Air Equipment is its monitor because it lets you choose from three different programs or modes. 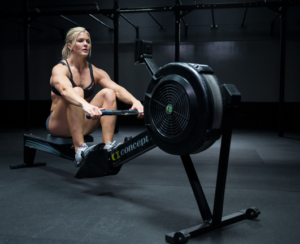 You can set a distance to row, a specific amount of time or a total number of calories you want to burn, and the equipment will let you know when you hit your goal. This monitor also shows information relating to distance, calories, time, level and other settings. If you read feedbacks, you’ll find that Stamina gets some of the top reviews, but great customer reviews are just one reason why we like this Stamina Avari Programmable Magnetic Exercise. It comes with an impressive 12 built-in workouts that include one designed to get your heart rate up and six that let you squeeze in a longer or shorter cardio workout. You also get four workouts that you can customize based on your own needs or goals and a manual option that lets you use the model right out of the box. It’s In Touch Fitness Monitor clearly shows your strokes per minute rating, calories burned, distance rowed and other features, but it also has simple arrow buttons that let you change your resistance level or time you want to row. As this is a backlit LCD monitor, you can always see that information. The Avari comes with adjustable straps on each foot pedal and a contoured seat too. 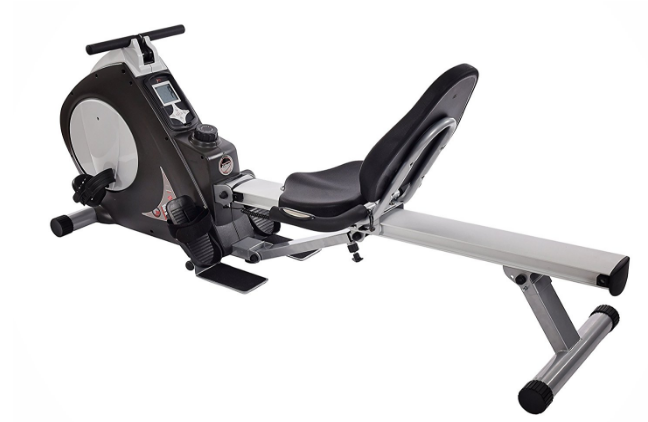 No matter what area of your body you want to work, you can target all muscle groups with this Stamina 15-9003 Deluxe Conversion II Recumbent, which works as both a recumbent bike and a rowing machine but takes up less space than those two equipment normally would. Its electronic monitor features an LCD screen that shows you information like the number of calories burned or the amount of time spent on a workout, and this monitor works with the built-in sensor in the grip to keep track of your pulse too. It uses magnetic resistance to keep noises to a minimum and comes with eight levels of resistance. It features a top bar that lets you work your upper body at the same time that you work your lower half and an adjustable seat that you can move back and forth when using or keep in one spot when biking. That seat has both a contoured base and a tall back. 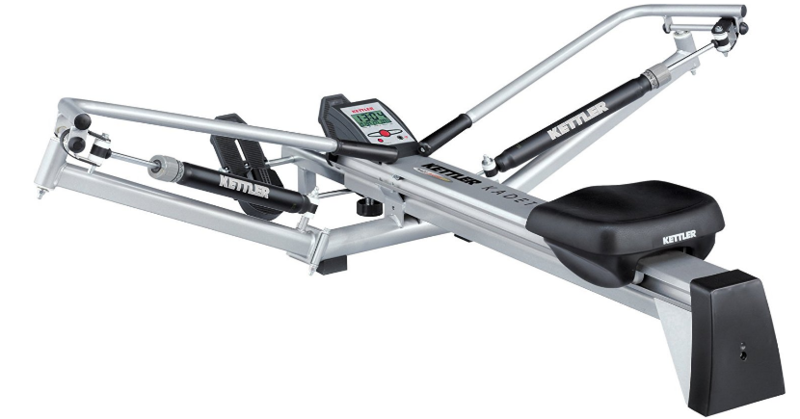 The Kadett Outrigger Style from Kettler Home Exercise/Fitness Equipment is the best hydraulic piston model on the market. Those pistons have a commercial design that is similar to the design found on professional equipment and feature knobs that let you adjust the resistance in 12 different ways. No matter how long you want to workout, you’ll love that the padded seat cushions and cradles your lower body to keep you comfortable. Stamina has such a great reputation online that it’s not surprising so many of its models like the Stamina 1445 Wave Water landed on our list. It comes with a water tank that hold water and allows the flywheel to move through that liquid to make it sound like you’re on the water, but you’ll also get a siphon that you can use to fill the tank with more water or to empty the reservoir before moving the model. Built-in wheels on the bottom of it help you move it anywhere in your home. An attached monitor shows you all the info that you need during a workout and comes with an arm that you can raise or lower to adjust your view of the monitor. 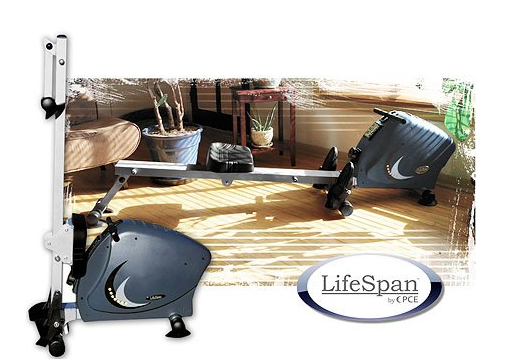 One of the best models for those looking to save some money while getting in shape is this LifeSpan RW1000 Indoor, which is one of the most affordable models. A 16.5-pound flywheel provides extra resistance to keep you on your game and to stop you from slacking off, but the cage that surrounds this flywheel cuts down on the sounds that it makes. Though it measures more than seven-foot long when assembled, it folds into a smaller package that measures less than three-foot long. Its solid steel frame can support users weighing up to 300 pounds, and it comes with a warranty that covers parts for two years, labor for one year and the frame for five years. Winner of the Gear Awards Seal of Excellence, it also features a monitor that has three separate screens for viewing features like time, distance, strokes per minute and calories during a workout. It also comes with a handle that pops out from the frame and slides right back inside when you finish. The Stamina X Air is one of the top models for those who don’t want to sacrifice a lot of valuable floor space just for a piece of exercise equipment because it has wheels that let you roll it around your home and a folding design that reduces its overall footprint. Featuring a steel frame, it also have pivoting foot plates that help you get your feet to the angle you want for a longer workout. Those pedals can accommodate feet of different sizes and come with straps for securing your feet in place. A large metal cage on the front stores the flywheel, which uses natural wind resistance to help you burn more calories. It features a built-in monitor that records basic information like time spent on a workout and total distance rowed as well as a durable padded handle above the monitor and a molded seat. The top equipment for those who need more space and those who don’t have a lot of space to workout is this Marcy Foldable 8-Level Magnetic Resistance with Transport Wheels. Not only does it come with built-in wheels that let you lift the equipment and push or pull it around your home, but it also folds down to reduce the amount of space necessary to store it between workouts. A resistance knob right on the front of the model lets you adjust the resistance level to one of eight different levels to reach the intensity level that you want. Though it does not have a seat back, it does have an ergonomic design that creates the proper distance between your body parts and the equipment to reduce the risk of injuries and to keep you comfortable. The seat itself has some extra padding, while the foot pedals have an adjustable design to fit different sizes of users. It also comes with an adjustable LCD panel that you can move into different positions for the best viewing. With an impressive eight levels of resistance that you can adjust with just a turn of a knob, this Sunny Health & Fitness is perfect for those who want to start a workout quickly. The handlebar on the front is large enough for you to put both hands on it, and it comes out and slides back inside the equipment to help you do the exercises you want to target areas of your upper body. Each foot plate has a textured surface that keep your feet from sliding off and straps that you can use for added stability. Its seat has a small amount of padding to cushion your body and slides easily along the pole with minimal effort. That bar is slightly longer than those found on some models and can accommodate all the users in your home. It also features a digital screen that acts like a built-in computer to keep track of calories, distance and other parts of your workout. You can check out our other Sunny Health and Fitness model review. 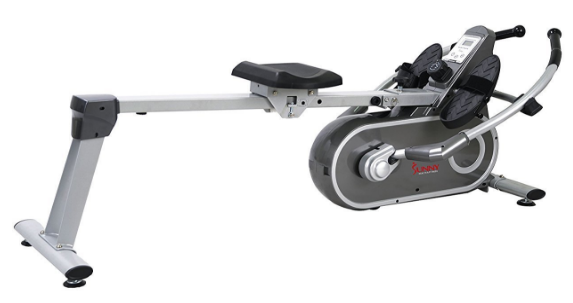 Burn more calories than you ever thought possible each time that you hop on this Full Motion Magnetic by Sunny Health & Fitness, which is the best rowing machine for those tired of dealing with cords and cables. Unlike similar models that have handlebars attached with cables, this one comes with metal handlebars on each side that rotate and pivot in different ways to help you target all the muscles in your upper body. It features a magnetic tension system that lets you adjust the resistance to increase or decrease the intensity of your workout. Nonslip grips on each of those handlebars allow you to work up a sweat without your hands sliding off, and during longer workouts, you’ll application the cushioning offered by the padded seat. This is one of the only models with built-in wheels that gives you a full range of motion and the support that you need. It also comes with its own monitor, conveniently located in the center of the equipment, to help you record and keep an eye on all aspects of your workout. Another good rmodel available from Sunny Health & Fitness that can help you get in shape or train during the off-season is this Air Magnetic with Dynamic Response. Many models like this equipment because it functions like a magnetic but also comes with a built-in air model that can use air resistance as they workout. When you use the magnetic tension system, you’ll find that you can move back and forth between eight resistance levels via the knob in the center of it. Both the models work together to create a dynamic response that lets you actually feel that resistance, as you pull on the handlebar, which has space for both your hands and, pulls out from the equipment to let you target your upper body with specific exercises. In addition to nonslip grips on the handlebar, you’ll notice textured grips on the foot pedals to keep your feet on each one as well as straps that wrap around your shoes. Its display, which is just above the handlebar, shows information relating to each workout like distance rowed and calories burned. This Stamina ATS Air just might be the best model for the money because it comes with a great warranty from Stamina that covers all working parts for 90 days and the frame of the equipment for three years. As an air resistance model, this one doesn’t require any outlets and lets you work out anywhere you have space and whenever you have time available. It features a seat rail that has an angled design to keep the seat moving and a molded seat that lets you sit for hours without any discomfort. 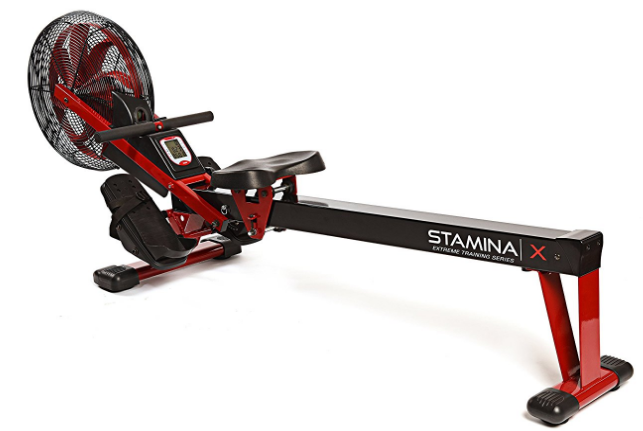 Stamina moved the wind resistance portion of the rower to the center and put the monitor on top, which helps you more easily and clearly see the distance you rowed, calories burned, time spent rowing or the speed that you hit. It also comes with foot plates that feature a thicker piece of plastic on the back and adjustable straps that keep your feet in place. You’ll like that it comes with protective elements that keep the feet of the model off your floor, its built-in wheels and that it folds down. The Stamina 1205 Precision marks the last appearance of Stamina on our list, but don’t let its placement put you off from investing in this equipment because it’s still a solid choice for those just starting out. Designed for use directly on the floor, it is just over two-feet tall and has a folding design that reduces its height for rolling or pushing right under your bed. 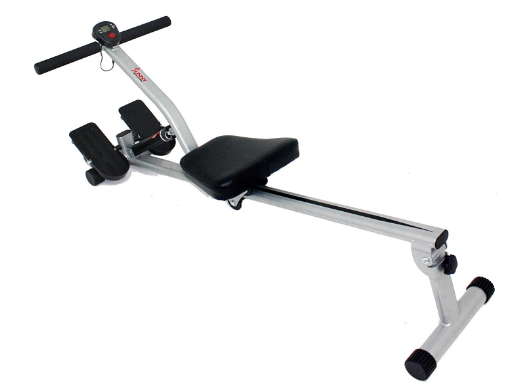 It features handlebars on each side that use hydraulics to provide the resistance you want when doing curls and other exercises to target your arms, and the ball bearings used inside ensure that it moves smoothly too. Unlike other models that use air or magnets, it can also use your own body weight to increase the resistance that you feel as you move back and forth. Its fitness monitor keeps track of the number of strokes you did, the speed you hit and the distance you rowed to help you see how quickly you improved over time. The 1205 from Stamina also has pivoting foot pedals that help you get your feet into a more comfortable position and a padded seat. This Soozier Magnetic Folding offers a smooth and comfortable ride at a price less than you ever expected to pay. It has a durable metal frame that supports the whole equipment as well as the weight of any user on top and features a shock-resistant design that makes the seat move just as smoothly as your strokes. You have the option of folding the equipment to store it in an out of the way spot or flipping it over and storing it in an upright position on a wall or in a closet. Though you cannot move the ABS monitor, it sits in a central location that you can see as you move back and forth. Not only does the monitor show you the time spent working out, the number of strokes you made and a number of calories burned, but it also has push buttons that let you set the monitor, change the mode or reset it. 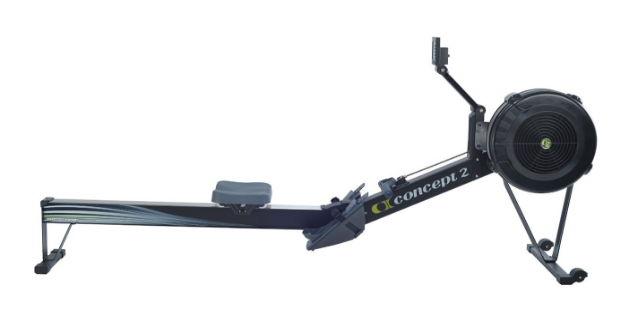 Our Favourite Concept2 Model is.. 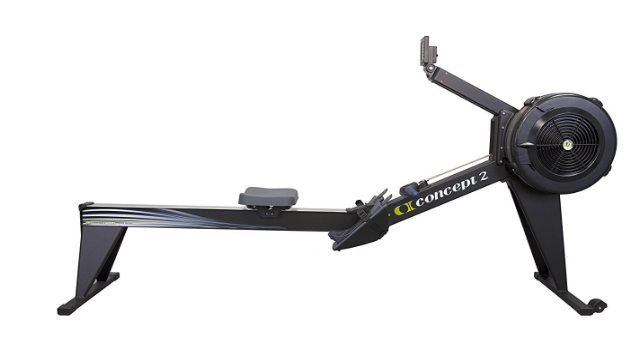 It only took one look at the Concept2 Model E Indoor with PM5 for us to realize that it was the best Concept2 model. Designed for indoor use, it can make you feel like you’re actually in a boat and on the water. It works your entire body and features a flywheel that moves more smoothly to cut down on the noise produced and to keep that noise from distracting you as you workout. The included Performance Monitor 5, also called PM5, keeps track of speed, distance and other settings to keep you informed of each workout, and the arm that supports the monitor is adjustable. 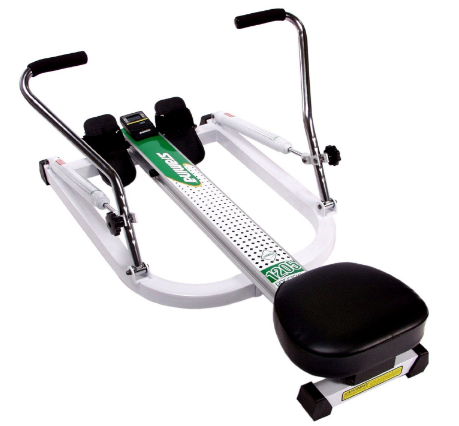 It comes with good back support and a back that measures 20-inches tall as well as an adjustable footrest and handles with an ergonomic design that help you keep a better grip on the machine as you sweat. 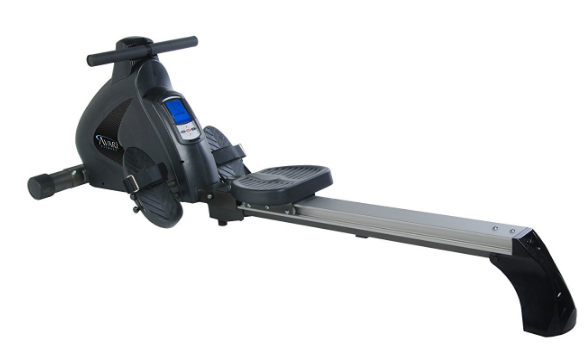 The Concept2 Model E Indoor with PM5 not only measures nine-foot by four-foot to take up less space, but you can break it down into two separate pieces for more convenient storage. Though the top water resistance model that we found is a little on the expensive side, this Stamina Elite Wave Water 1450 is a great choice for those looking for a water resistance model that costs less, but we also ranked this as the best model from Stamina. This model comes with a sensor that fits over your chest with the included strap to keep track of your heart rate, and it will instantly beam that information back to the monitor that sits on the front of the equipment. The flywheel sits inside an enclosed tank filled with water that produces natural noises as you stroke, and you can change the intensity of your workout when you change the intensity of your stroke. Its molded seat mimics the contours of your own body and is larger than other seats to accommodate your body when you start working out and after you lose weight. Each of the footrests on this equipment has straps that keep your feet from sliding off and an adjustable design that fits your exact stride and body length. At just 89 pounds, this is one of the lightest models that we found, which means that you can move it without straining yourself. 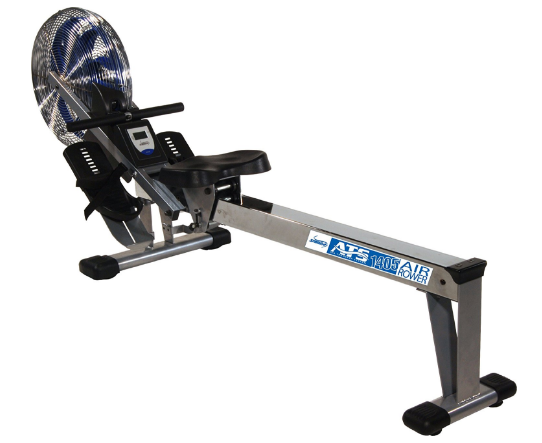 Next ArticleStamina ATS Air Rower Review: Is It a Good Addition to Home Gyms?